If you are using Web 2.0 tools, then you do have a web presence. Have you googled yourself lately? Unfortunately, the Internet does not allow us to categorize ourselves to make a distinction between our personal and professional selves. This is true for everyone. Do you think students, parents, and even prospective employers use Google to check you out? You bet. Do you think universities offering scholarship use Google to check out prospective students? Yes. Do you think students think about their own web presence and how it relates to their future. They should. After you’ve googled yourself, remember this. Check the settings in all the Web. 2.0 tools you use to see how to set the privacy and lock things down. If a tool offers no control over what others see, is it a Cool Tool? 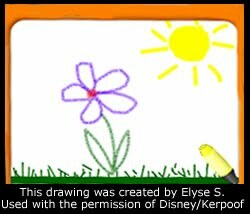 Kerpoof Studio is another tool for drawing and creating on the computer. It’s kid-friendly, and again, no sign in is needed to use the tool in it’s most basic form. But, Kerpoof does offer free teacher accounts which are certainly worth the trouble of creating. Teachers can create student accounts and also limit the features accessible to students using Kerpoof. As an added bonus, there is an entire Kerpoof for Teachers page with lesson plans, standards, a useful newsletter, and more. There are many options available within Kerpoof studio, and some are more educationally appropriate than others. It’s important that students using this tool have a clearly identified learning goal when using Kerpoof in an educational setting or they will just play. Drawing and painting can create a bridge between the ideas in a child’s head and the blank piece of paper. Students are generally pretty movitivated and engaged when drawing and painting on the computer, and many are very good at it. In an effort to encourage content based writing and promote tech literacy, I’d like to introduce you to a very good, easy to use, online painting tool. This simple tool is designed to bring out the artist in us all. It records the process used to paint, then makes it available for viewing. There is no login required and students can easily use this tool. Teach students to take a snapshot of their finished painting, then insert the picture into a document for writing. View the artpad gallery glog to see what some of our teachers have created and please consider submitting a painting of your own for display. Student paintings are appreciated too!